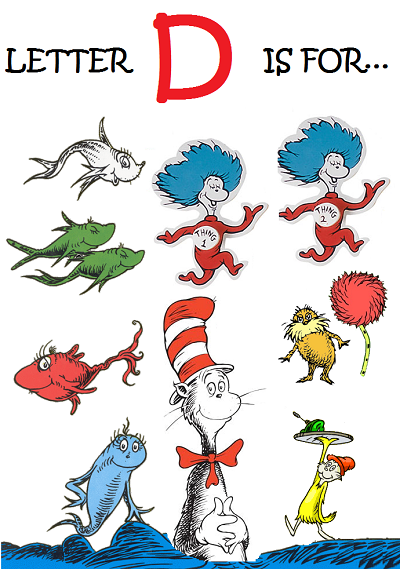 “Letter D is for Dr. Seuss Week” is Next! “Letter C is for Colors Week” was a Complete suCCess! Not only did the students bring in many colorful shares, they dressed in particular colors each day! Take a look below. Thanks to one family, the students also had a few Colorful Costumes to try on! Here are some colorful crayons along along with some Yellow costumes from “Wear Yellow Day” and some letter C costumes! On Monday and Tuesday morning, the students (wearing red and yellow respectively) worked diligently to complete their “Letter C” tracing/writing identification activities. In preparation for parent-teacher conferences, the morning letter recognition work from this week was collected and filed. 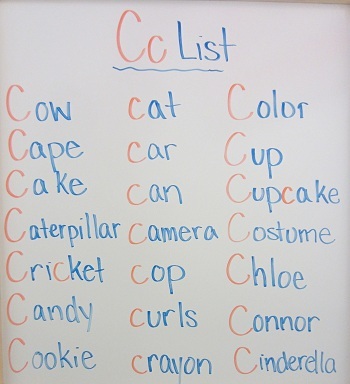 During the afternoon, the students created a Letter C Word List and went hunting for C’s around the classroom. Here is their list from Monday! Also on Monday afternoon, the students were paid a visit from a PPA graduate! Now in Kindergarten, the student photographed below came back to visit and read a story to her former classmates and teachers! The students were thrilled to see their old friend and hear about the wild and exciting world of Kindergarten! What a great reader she is! What a special day! On Wednesday, the students began their “Letter C is for Colors” art exploration! The teachers decided to bring back a fun (albeit a bit dated) method to make a colorful creation – Spin Art! Watch below to see one student in action! Photo Sharing – Video Sharing – Photo PrintingThe students were so excited to see how the paint drops changed while being spun around on the wheel! The colorful spin-art looked so Cool and different! Here are a few examples from the students Spin-Art activity! During the afternoon on both Wednesday and Thursday, the students had Spanish class where they continued to learn the new songs and greeting vocabulary. This week, the teachers introduced Los Numeros (Numbers). Here is the vocabulary they learned. On Thursday morning, the students began their day with a reading of Ellen Stoll Walsh’s classic story, Mouse Paint. In the story, three mischevious mice climb into jars of colored paint – a yellow jar, a red jar, and a blue jar. After a while, the mice come out of the jars and begin playing and dancing around which leads to a big, drippy but colorful mess! They quickly begin to notice that the colors seem to change before their very eyes! After hearing the story, the students had the opportunity to test this idea out themselves! Here is how they did it! Can you believe it? The mice were right! The colors do blend together and change! Through their messy investigation, the students learned how the following colors mix together. After they experimented, the students headed to the art easel to continue the color blending! Each student selected two colors to paint with and mix! Here is how the project turned out! Friday was the Park Prep Pumpkin Picking Party – try saying that three times fast! Due to rain, the Park Prep Pumpkin Patch was moved indoors but it did not affect the level of fun that the students had pumpkin picking! The students walked around the indoor pumpkin patch and carefully selected the perfect pumpkin! After the pumpkins had been “picked”, the students moved over to the tables and began decorating! Using felt pieces, sparkly sequins, feathers, pompoms and more, the students and their parents transformed the regular pumpkins into sparkly masterpieces! The pumpkins were set aside to dry before the party wrapped up and the students headed home to enjoy the weekend! The pumpkins sure looked incredible! Thank you to all of those in attendance for our Pumpkin Picking Party! We hope you had as much fun as we did. See you next week for some more alphabet fun – it’s going to “D-lightful! 🙂 Be sure to scroll to the bottom of the post to view all of the photos from the PPA Pumpkin Picking Party. As always, thank you for reading and have a fun and safe weekend! Due to a near 100% projected attendance, we kindly ask that attendance to the party is limited to the PPA student and Mommy and/or Daddy. Click here to view all of the photographs from the 2012 PPA Pumpkin Picking Party!